Obituary – Foster, William George “Woody” « Perry High School Alumni Association, Inc.
William G. “Woody” Foster, long-time operator of Foster’s Corner Drug Store, was pronounced dead upon arrival at Perry Memorial hospital at 9:45 p.m. Wednesday, March 24, 1982, after falling from a ladder at his home. A Perry fire department ambulance was dispatched to the Foster residence at 711 Fourteenth street at 9:30 p.m.
Funeral will be at 10 a.m. Saturday at the United Methodist church with Rev. Don Johnson, pastor, officiating. Burial will be at Grace Hill cemetery under direction of Parker Funeral home. Foster apparently had climbed the ladder on the outside of the home to reach a door leading to the attic. He was attempting to gain access to the pilot light of the central heating and air conditioning unit. Apparent cause of death was a head injury suffered in the fall. Foster was born in Phoenix, Ariz., Feb. 23, 1919. He came with his family to the Perry community in 1919. He was a 1938 graduate of Perry high school and a 1942 graduate of the University of Oklahoma school of pharmacy. He served with the United States Army from 1943-44, then returned to Perry where he entered business with his father, the late Ralph Foster Sr. He and Florence Saunders were married June 2, 1951, at Perry. 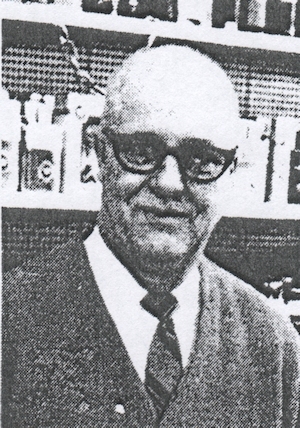 Foster retired and sold the drug store in 1972, but frequently assisted the current owner, Mike Shannon. Foster was a member of the United Methodist church and the Perry Masonic lodge. In addition to Mrs. Foster, of the home, survivors include one daughter, Mrs. Sylvia Perkins, Tonkawa; his mother, Mrs. Ralph Foster Sr., Perry; a brother, Ralph E. Foster Jr., Stillwater; four grandchildren and two nephews.